Alejandro Quijada Ode: “Being a part of Catholic communities (in Brisbane) has boosted my faith at a really fast pace. WHEN Alejandro Quijada Ode emigrated to Brisbane in 2016 the inflation rate in his home country of Venezuela was 800 per cent. Today it is estimated to be as high as 10 million per cent. A 2019 United Nations report estimated 3.4 million Venezuelans had left their country. Ninety-four per cent of those who remained were living in poverty, the report said. Mr Quijada Ode said the crisis in Venezuela was an example of how socialism could turn a rich economy into “one of the poorest and corrupt economies in the world”. 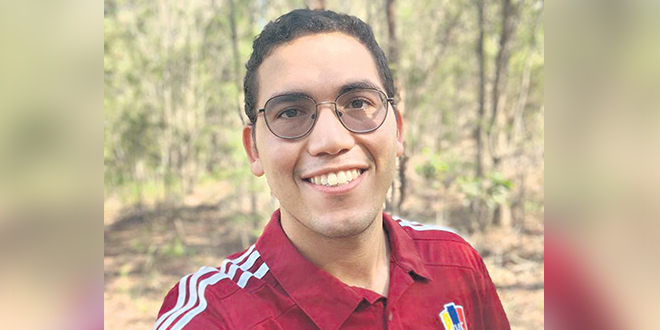 “In my opinion, socialism is a failed system which has never obtained good results in any country where has been implemented,” Mr Quijada Ode, a 26-year-old civil engineering graduate, said. Mr Quijada Ode is a devout Catholic and has relied on his faith through the good times and the bad. “The Catholic Church has been an important part of my whole life. And here in Brisbane hasn’t been an exception,” he said. A chance encounter with a bible study group at St Stephen’s Cathedral led him into a community he now calls his family. “I came to the cathedral on July 1, 2016 – the day after I arrived in Australia – thinking that there would be a 6pm Mass (this was the common Mass time in Venezuela). “I approached a missionary candidate, her name was Teresa (Sr Teresa Gasparin) and she invited me to be part of the Verbum Dei School of the Word, which was about to start in the choir room beneath the cathedral. Mr Quijada Ode said the opportunity to see Catholic life from a different perspective had been a blessing. “I just feel blessed by God who provided me with an extension of my family here in Australia, now I can say my family is half Venezuelan and half Aussie,” he said. “Being a part of Catholic communities (in Brisbane) has boosted my faith at a really fast pace. “For my future, I hope to give my contribution to help Australia become a better country.